Rollators are simply walkers with wheels at the end of each leg. There are 3 wheel and 4 wheel varieties. It can become difficult for some people to use a standard walker. Traditional walkers require more strength and endurance. Rollators are a solution that allows for greater and faster mobility. They come with a variety of features like pockets, baskets, seats, and backrests for taking a break. These features are designed to enhance daily life and practical use. Be sure to shop around before you purchase to discover which model would be the best fit for you or your loved one’s needs. People who use a rollator need support. They might use a cane but require a stronger support for more balance. Or they may be using a traditional walker, but desire more mobility. People may find that a regular walker needs strength that they no longer have. Compared to wheel-less walkers, rollators are meant for people who need a walker primarily for balance, not for weight-bearing. However, many rollators can hold significant amounts of weight and may even have a seat that allows you to take a break when needed. There are several types of rollator on the market. A few features will make a large difference in your experience, while others are cosmetic or come down to personal preference. The most important aspects to consider are weight, width, whether the rollator has a seat and the number of wheels. A typical rollator will have 3 or 4 fully rotating wheels, breaks, sometimes a seat, and often a type of storage like a pouch or basket. There is also the option to choose a heavy-duty rollator, usually called a bariatric rollator. These walkers are wider than average and can accommodate overweight or obese users, and have weight capacities in the 500 to 700-pound range. Getting a rollator that matches your height should be your first concern. Fortunately, there’s an easy way to take your measurement and find the right support. To measure your optimal rollator height, first put on the walking shoes you usually wear. Let your arms hang down loosely at your sides. Then, measure the distance from your wrist to the floor. This distance will give you an accurate measurement of the height where you’ll have a comfortable grip. The large size of regular walkers is a hindrance for many. If it’s important for you to be able to fit through narrow spaces, make sure you look up the width of your desired rollator and compare it to the areas you regularly visit. Check your home for any small or tight spaces. If you have places you frequent, take a measurement of how wide these spaces are, so when you’re shopping for a rollator, you’ll know exactly where the cutoff width is. If your rollator has a seat, you’ll also want to make sure the seat height is comfortable for you. Simply use a comfortable chair from home as a reference. If you can get in and out of a chair easily, that’s the height you should look for in your rollator. There are several extra features that you might not have considered. Here are the most common and why you might want to consider them. Although you might plan on using your rollator frequently, most people prefer the option to store it in a closet or somewhere out of the way. It’s especially useful to be able to fold up your rollator to place in a car. It may not seem like a big deal, but a padded seat can make a big difference in the enjoyment of your walks. If you need to take a break, why not take a comfortable break? If you have hip problems or have difficulty sitting on hard chairs, a cushioned seat is must. You can even find ergonomic seats or handles, which support a healthy posture and grip. 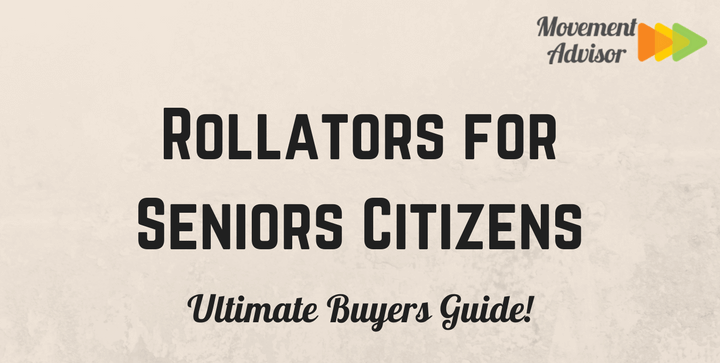 Your tendency might be to look for a rollator with small wheels because it seems compact. However, large wheels are preferable. Small wheels can get stuck easily in cracks or have difficulty moving over uneven ground. To avoid this problem, shop for wheels with at least an 8-inch circumference. Many rollators have baskets, but these can be bulky and make traveling with your rollator difficult. Pouches are rapidly becoming more popular for their versatility. You can fold up a pouch if you’re not using it or if you’ve purchased a foldable rollator. A basket with a foldable rotator can remain bulky. One feature that many people appreciate is the ability to adjust the height of your rollator. This feature can account for differences in terrain or added height from shoes. It’s a convenience and there’s no pressure if your initial measurement was a little off before you made a purchase. What the Difference Between 3 Wheeled and 4 Wheeled Walkers? Each type of rollator has its own merits and depends on your needs and preferences. However, the two are very different, and you shouldn’t begin shopping without understanding the differences between them. The 3-wheeled walker is light and flexible. This rollator can make tight turns and fit in a greater variety of spaces, including narrow hallways or crowded areas. This property makes them ideal for indoor use. To take full advantage of the 3 wheeled walker’s benefits, you should look for a light frame, like aluminum. The only drawbacks are that 3 wheeled walkers don’t support as much weight and don’t include seats. The 4-wheeled walker is more stable and mimics a traditional walker, but gives your greater mobility. It can take more weight and usually has a seat that allows you to take a break. Usually, 4 wheeled options have a wider range of height adjustments. In a 4-wheeled walker, you should look for a stable and durable frame material, like steel. Some also include a backrest with the seat. The Hugo Elite is a 4-wheel walker that comes in blue and garnet red. It comes with a seat and built-in backrest to allow you a comfortable break when you need it. Underneath the seat there’s a storage bag and a saddle bag, leaving plenty of room for your belongings. Both the seat and handle height are adjustable. The hand grips are ergonomic and placed at a comfortable, natural angle. Its weight capacity is up to 300 pounds. Wheels are 8 inches, giving you greater stability and ease in covering a variety of terrain. A hand brake lets you lock your rollator whenever you need. This rollator folds up and fits into the average car trunk. As a bonus, assembling this rollator doesn’t require any tools, so it’s easily manageable. The handle height ranges from 29.5 to 38 inches high, while the seat can go from 19.5 to 22 inches. This walker is 27.5 inches long and 24.5 inches wide. This Drive Medical rollator is the standard and one of the most popular. It has a sturdy but padded seat and a backrest that can be folded to get it out of the way. This 4-wheel walker has a steel frame but is still foldable. It comes in blue and red. There is one basket to hold your belongings. The wheels sit in 7.5-inch casters that include loop locks to keep your rollator in place while you’re resting. The entire rollator is 23.5 inches wide by 25.5 long. The seat is 12 by 12 inches, and the handle height ranges from 31 to 37 inches. A lever allows you to adjust the handle’s height and angle. This 4-wheel rollator is a bariatric, or heavy duty, walker and can support up to 400 pounds. It weighs 19 pounds, and its dimensions are 29 inches wide by 29 inches long. There’s a greater distance between the handles compared to standard 4 wheel models. The manufacturer cautions that its width may not fit through all standard doorways. The Medline Heavy Duty is 44.5 inches high with 8-inch wheels. Each wheel’s spokes and forks are reinforced for greater strength and durability. It has a padded seat that is 17.5 by 14 inches. Underneath the seat, there is a velcro pocket for storage and convenience, in addition to a wire basket. This wheeled walker is foldable but may not fit into all cars. The 3 Wheel Traveler from Nova Medical Products weighs 16 pounds and has a weight capacity of 250 pounds. It’s available in three colors: black, blue, and red. Being a 3 wheel walker, the Nova makes it easy to maneuver in a variety of different spaces. It has 8-inch wheels, which help it navigate rough or uneven terrain. This rollator has hand brakes for easy control and is foldable. Storage includes a large zippered pouch and a removable basket and tray. The handles are 12 inches apart, and you can adjust the height from 33 to 37.25 inches. The Nova rollator is 24.25 inches wide, and 23.75 inches long. The Winnie Lite from Drive Medical is another 3-wheel walker. It weighs only 11 pounds but has a 300-pound weight capacity. It uses a loop lock with the interior made of aluminum for easy and safe use. The 7.5-inch casters encase soft-grip tires that work well in or outdoors. There is a standard carry pouch that comes in a unique tan plaid design, or in black for the flame blue and flame red color options. The overall width of the Winnie Lite is 26 inches, and the walker is 32 inches high by 22.75 inches long. The handle height is adjustable and ranges from 31 to 38 inches.